When you purchase a new truck or car, one of the first things most people want to update is the OEM sound system. The best improvement you can make to a stock system is to add a sub woofer. Then reality sets in and the new vehicle owner realizes installation of a sub woofer requires a substantial amount of room be sacrificed to the sub and amplifier. But we all know that a good subwoofer translates into quality bass sound. So the problem is to add a large speaker into today’s smaller vehicles while not encroaching upon valuable space. 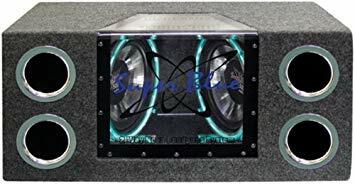 Today, many are considering the huge variety of custom subwoofer enclosures which not only allows the addition of a subwoofer but also provides a stealth or OEM style installation. The new custom subwoofer enclosures are manufactured by companies such as MTX Audio, QLogic Q-Customs and BassForms. It’s safe to say that between these three manufacturers, you can find a custom sub enclosure for just about any popular vehicle. MTX and QLOGIC has perfected the use of special composite materials to form their custom enclosures into discreet installation locations for most vehicles. While many sub boxes are designed to fit behind or under the read seats in trucks, most custom boxes for automobiles have been designed to install in hide away places in the rear hatch or trunk. This enables the vehicle owner to keep his Bass Sound investment hidden from prying eyes and still allows him to enjoy the functionality of his specific vehicle. BassForms is a manufacturer of high end fiberglass custom sub enclosures. These fiberglass models deliver even a deeper, richer sounding bass. This manufacturer also provides a large variety of universal style boxes which are perfect for the popular SUV of today. Many even include a special mounting area for your amplifier as well as the subwoofers. MTX audio custom subwoofer enclosures are available pre-loaded with MTX subs and even come with an amplifier built-in. These are exceptional since they enable you to hide your amp, as well as your subwoofer. A side benefit of this box is they also are very easy to install since the sub and amplifier are pre-wired. Just hook up to an appropriate power source and you are good to go. What level of sound performance do I need? How much space am I willing to give up? Where you put your sub depends on your vehicle but with a custom subwoofer, you can get something perfect for your make and model. In optimizing placement of subwoofers in vehicles, one must be aware of the “transfer function” of the interior space of the vehicle, commonly referred to as “corner loading”. Bass is resonating air, and it’s easier to do that in the semi-trapped air of a corner. Therefore, the best place to locate your sub for maximum output is in and toward a corner. Unfortunately, this is not always where you would like it for aesthetics or ease of use, however, it will be loudest there and may allow you to have a smaller box and/or amp. Also, if you use a “bandpass box” (which is the best type for use in vehicles, which need small size and high output over a narrow band), it will also minimize the slight port noise inherent in all ported boxes. In home stereos, this corner loading is undesirable, producing an unnatural peak of sound energy at a low frequency, however in a car, or especially a truck, it is very welcome to do battle with the road rumble trying to mask your music’s rhythm. Bass is the resonating of air. In order to hear (or feel) bass, you need to resonate the air near you. 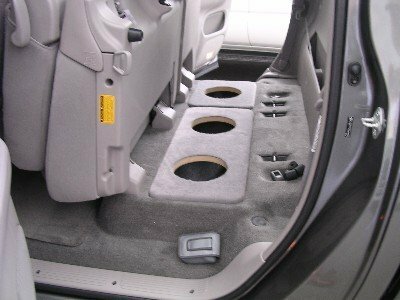 If you put a subwoofer inside a closed trunk only a small portion of the bass can be heard or felt in the cab of the vehicle. However, in sedans, there is no other place for a sub, and so one theory (not a very good one), is to put in a huge sub and huge amp and hope it can be heard up front. This idea of wasting ¾ of the bass is not only very expensive, it leads to many blown subs since you can’t hear the amplifier’s distortion limit or the driver’s excursion limit. Some cars have seats that fold down but the opening is smaller than the trunk causing a destructive “loading” effect. In addition, there is the inevitability that you will close the seats up one day, causing the problems previously mentioned. Band Pass subwoofers are great for car trunks. A simple and very effective solution for sedans is to use a “band-pass” type of subwoofer enclosure since all of the energy is focused into a small tube that can be “ported” into the cab through the rear deck of the car. This way the box can still be in the trunk, but the bass can be in the cab. Two SubSolutionT models are made specifically for installation in these vehicles. The Thru Deck Port Kit adapts The Sports Car SubSolutionT with the use of a 3″ port tube. And for audiophiles, The Low Bass Trunk SolutionT provides twice as much bass energy through its 4″ port (the four and eight driver models can be modified for trunks as well). It’s simply a matter of feeding the energy into the passenger area-where you want the sound! “Driver” is the term used to describe the actual woofer that is in the box. The “basket”, (the stamped or cast metal frame), the “motor”, (magnet and voice coil part), the “cone”, (the big curved paper-like part), and the “surround”, (the foam or rubber edge that attaches the cone to the basket), are all parts of the driver. A “Speaker” is made up of two main parts – the driver and the enclosure. These two must be made with each other in mind in order to perform well. Size – is bigger always better? No. In fact most all people agree that smaller drivers sound better since they can react to the changes in the music faster. Larger cones have significantly more mass and it is very hard to get them to stop moving at one speed and start moving at another speed, which is what they need to do. This aspect is measured and referred to as “transient response”. “Efficiency” or “Sensitivity” refers to how loud a speaker will play with a specified amount of power on it. The standard for measuring it is to play 1 watt of power into it, and measure the sound pressure level (SPL) at 1 meter away, measured in decibels. For example, 89 db, @1 watt, @1 meter. In general, drivers with larger cones will be more efficient than smaller cones, all else being equal. 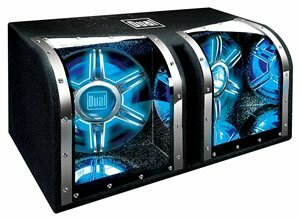 So be sure to consider a custom subwoofer enclosure for your vehicle before purchasing a standard universal box. You’ll be very happy with the results.